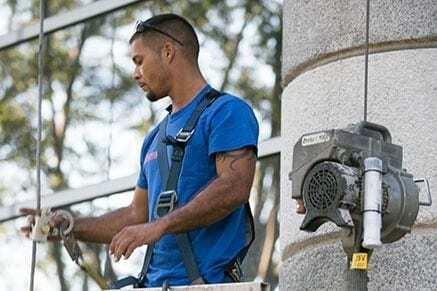 Florida’s sun, heat, rainy season and hurricanes combine to make leak repairs and waterproofing an ongoing maintenance concern for Florida property managers and owners. A1 Orange commercial waterproofing experts can determine the source(s) of water intrusion and repair minor water leaks; re-caulk/seal failing joint systems; and end water seepage/erosion due to sealant failure on porous exterior walls and surfaces. Being proactive on repairs and re-caulking can prevent extensive interior water damage in an active hurricane season. Whether you have minor water leaks, joint system failure, or water seepage, you can trust A1 to do the job right at a fair price. The source of water intrusion is not always obvious. A1 Orange’s commercial waterproofing technicians are experts at finding the source and re-pairing it. If you have more than 10 leaks, it may be time for a full re-caulking job. All of the joints work together as a system to seal your building envelope. As time passes, shrinkage, deterioration and delamination begins. When you re-caulk, make sure your bid includes removal of all of the old gaskets or caulk so that the new product adheres and qualifies for the manufacturer’s product warranty. If you are getting persistent water leaks or simply want to be proactive in assessing the extent of the problems and prioritizing any work needed, call us. An A1 Orange Waterproofing Inspection provides a detailed inspection of all the joints on your building, with pictures and physical testing. The cost of this time-intensive inspection may be deducted from the cost of waterproofing services when you contract the work within a specified period of time. We work with you to solve the problem(s) within your budget constraints. When the sealant on porous exterior walls, pool decks, retaining walls & features degrade and fail due to age, sun, and rain exposure, your property may get water seepage and erosion damage. Tell-tale signs? Your building may look wet for days after a rain, have white scaly build-up on brick/stone (efflorescence) or unexplained white stains on your glass (leeching). Professional cleaning and resealing will seal your building envelope and porous surfaces. When A1 Orange does your waterproofing, we remove old products and clean properly before applying new, quality products, according to the manufacturer’s guidelines. For caulking joint replacement, the manufacturer’s rep conducts adhesion tests so that you get the full product warranty. Why should you remove old caulking/sealant prior to applying the new product? The old product is failing, and your new caulking/sealant may not adhere properly. Not removing old product may nullify the manufacturer’s product warrantee. If bids are very different, check this important detail! If you begin to see multiple leaks, get an A1 Orange Waterproofing Inspection, which can help you determine priorities and the extent of emerging intrusion issues. Being proactive may save hundreds of hours of cleanup, negative impact on tenant relations and many dollars in water intrusion repair. Find our downloadable Waterproofing Bid Checklist here . Make sure you are comparing oranges to oranges on your bids! Don’t let nesting birds tear up your roof or eat caulking from windows. A1 Orange installs the best systems for each area where you need to deter birds from nesting. Let A1 Orange’s professionals safely change out light bulbs in your building’s exterior and interior high spaces. This can be in conjunction with other services or on a special visit.